This past weekend we had an AsiaNrail layout setup for the 10th annual Los Altos Train Days event. 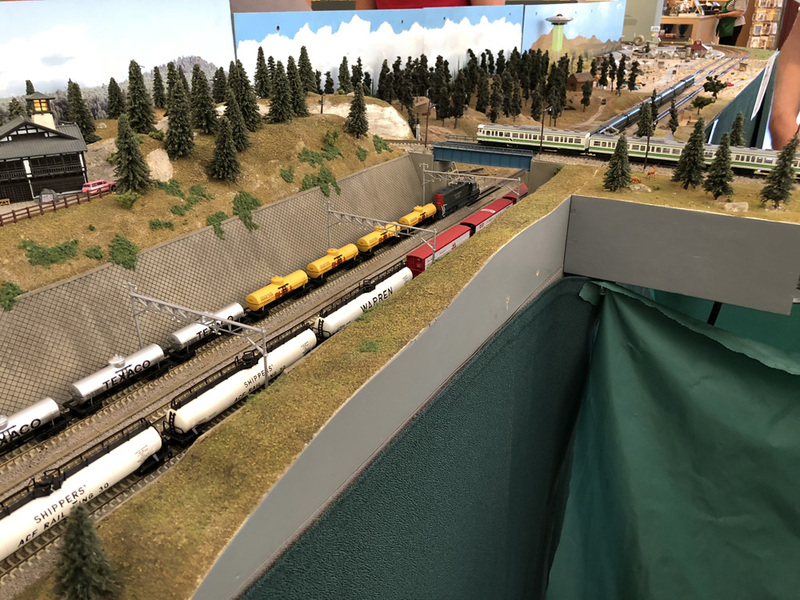 As we have done before, the Peninsula Ntrak club also had a layout in the same room with the mountain division track on my Hot Springs Junction Ntrak module being one of the 5 branches of the AsiaNrail layout. Here is an overall view of the AsiaNrail layout taken on Sunday morning before the show opened. This layout was like a 4 point fork with the link to the Hot Springs module being the handle of the fork for a 5th branch. With no connecting tracks to install the setup and tear down went more quickly. 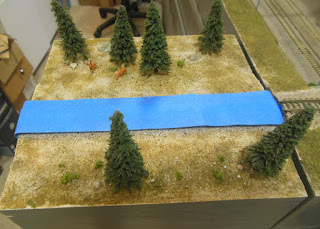 We did have to play around in the beginning keeping the alignment of the rails whenever modules got bumped. It seemed by late Saturday everything had settled in fine and we had no further derailments. 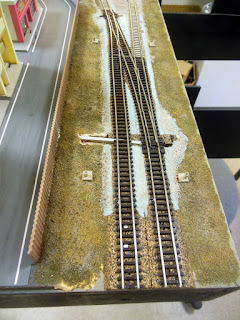 In past layouts with this configuration I had mounted the control panel on the front of the Hot Springs module but this time it got mounted on the back inside the Ntrak loop to keep the kids from messing with it. 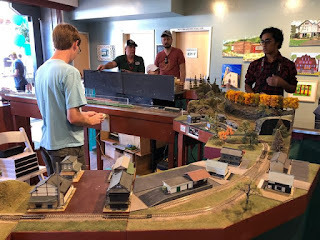 One of the Ntrak guys would move the points when needed. 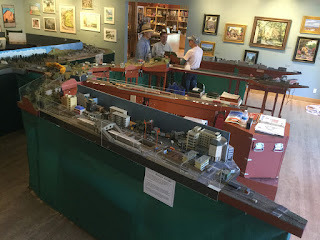 This photo is actually from the Hiller exhibit last spring but shows Paul's junction module which allows for two independent point to point operations or interchange. For this layout one long point to point operation was between my Hot Springs and Mushahi-Koyama modules. Besides Paul and myself, we had 4 other operators so a total crew of 6 which was just right for this setup. The public attendance was estimated by the museum to have been about 3,000. Thanks to Junior Flores and Julia Jackson for letting me use some of their photos. 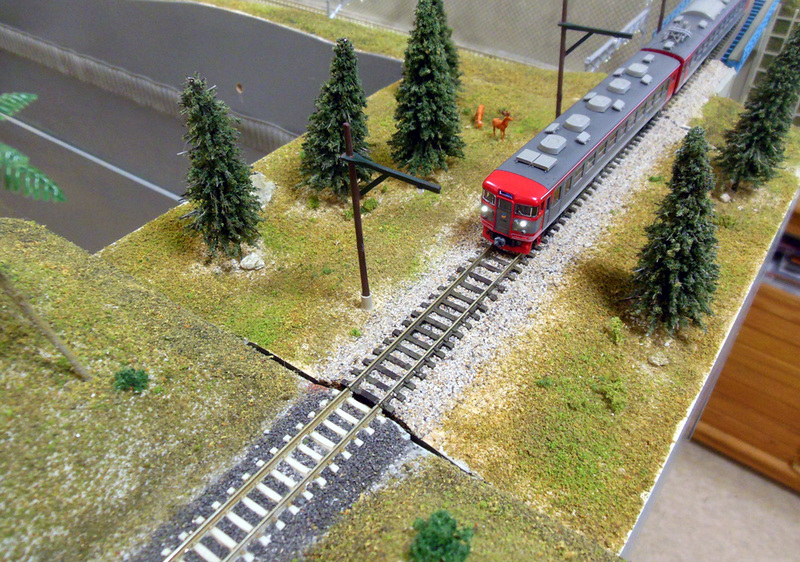 I had wanted to test both the track and electrical interfaces on the new module with the Hot Springs Junction module. When I was setting this up I realized that I had never installed the trolley poles on the small interface module and the scenery seemed a bit lite or faded compared the the main module. So after a bit of work here is the view after adding a bit of greener scenery to the small interface module along with the trolley poles. 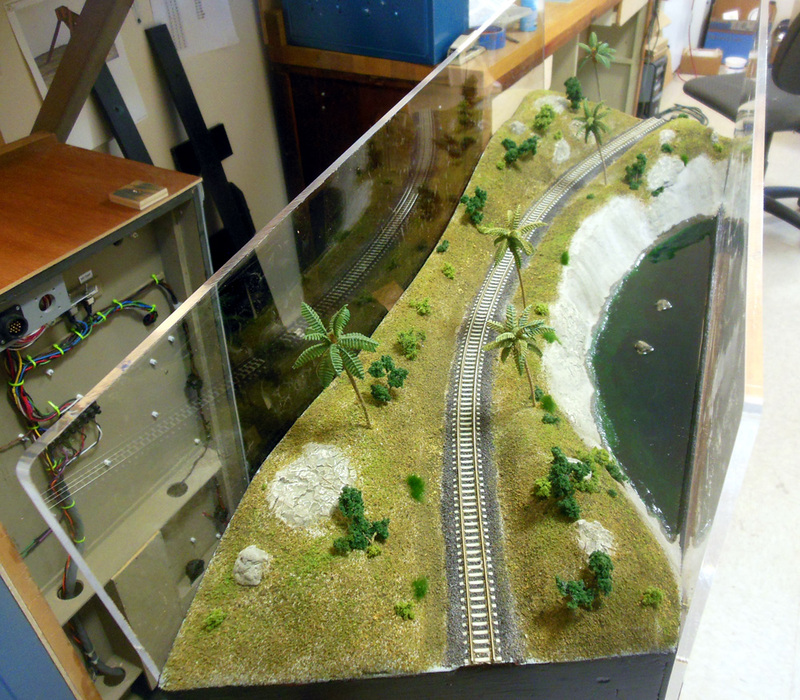 The track and electrical interfaces worked fine with repeated testing so this new module is ready for exhibit. Last I had 1/4 inch Acrylic shields made for this module and attached to each side with 8-32 thumb screws. 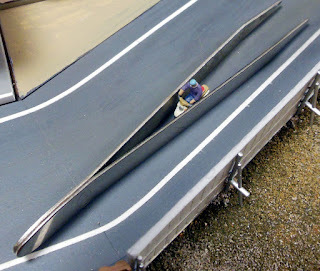 These won't been needed in every layout setup but I wanted them for this next show as we won't have any rope barriers. Just over two weeks left before the Los Altos Train Days show. I am making a final push to get some more scenery done and have been focusing on some buildings that have been left half done for quite some time. Here is the prototype photo of the exterior stairs on the side of what I call the mister Donut building. I built the model of the building back in 2011 and started the stairs at that time but never finished them until recently. These types of stairs are common on commercial buildings in Japan and I wanted to have at least one example of this. The stairs were built as a separate assembly which made them much easier to work on then. I tried to match the paint color of the original building as best I could and air brushed the stair assembly before gluing it to the side of the building. Here is the photo of the finished building. It feels great to finally have this project done. There are a few areas on the Musashi-Koyama module set that have remained only partly finished for several years now. 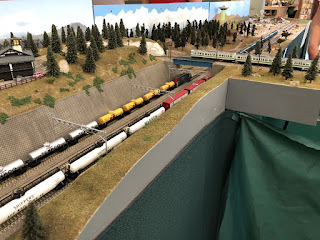 The work to replace some problem turnouts and extend the track to ends of the modules is now done and there is a bit of time left before the next show so I am going back and finally finishing up a couple of those. 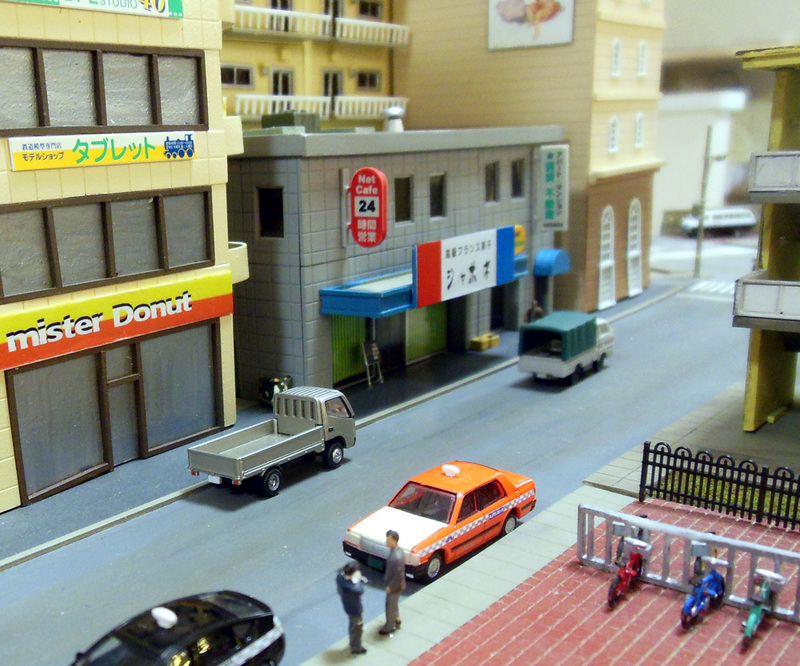 The scratch built mister Donut building now has tenants on every floor after I added some signs made from the stickers from various kits. I am also working to finish the exterior stairway for this building. 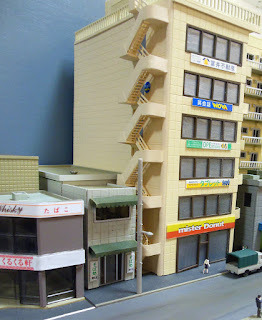 The two story building next to the mister Donut building is also now fully occupied by a french restaurant and a deli on the first floor and a 24 hour Internet cafe and a real estate office upstairs. I have also been adding a few more people and some motor bikes in various places. I use a tweezers to hold these 2 wheeled vehicles in place while the adhesive sets as shown in this photo. So, besides hopefully operating better with the new turnouts this module set will have at least some new scenery items in place. 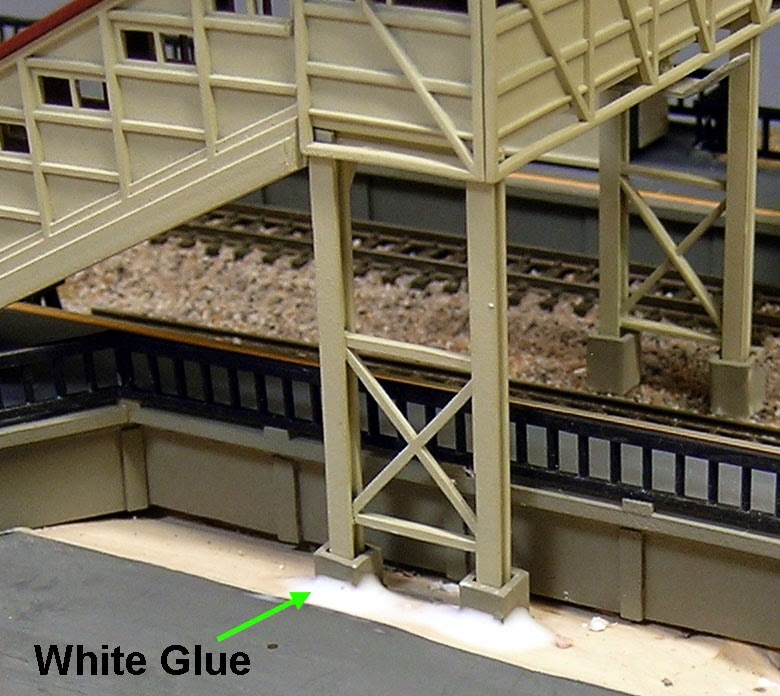 With only a month to go before the next exhibit, both Paul and I have been working on the modifications to the track on our module ends to have the next layout "joiner-less" as explained in last April's post Joinerless joints for a quicker set up. In past layouts we have had some problems with some equipment getting through the crossover at one end of my Musashi-Koyama module set so I decided to replace those turnouts with new Peco code 55 turnouts at the same time. 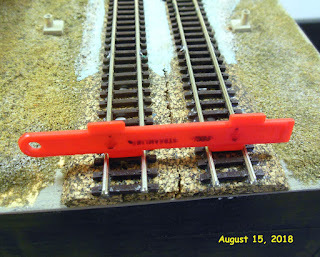 Because the Micro-Engineering and Peco turnouts have slightly different angles I had to remove some of the track back to the beginning of the platform to get everything to line up right. This photo shows the new cross over and track to the edge of the module. Paul had ordered several Peco double track spacing guides and gave me a couple. This is what we are using for a standard on all the double track module ends that we are modifying. The original Micro-Engineering turnouts will be rebuilt and reused on my American prototype home layout. A couple of posts ago I mentioned that we had used the JR Nambu line for part of our day trip to Ome in June of last year. We rode between Musashi-Kosugi and Tachikawa but this line is actually part of an outer loop line around the Tokyo area. We had used this line a few times before and have noticed newer and newer trains assigned to this line over the years. 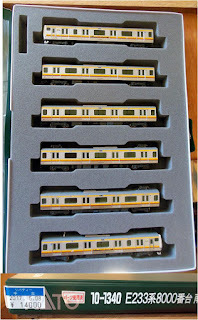 I took this photo of a 205 series train when we rode the Nambu line in November of 2011. 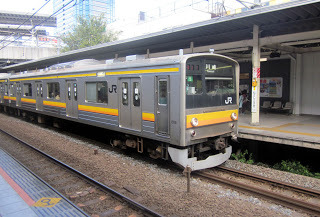 At that time this line was one of only a few in the Tokyo area still running these and they were later replaced with the 209 series. On this latest visit the 209's were gone and in their place were the the E233 series. This was no surprise to me as I had already read about this change on the Tokyo Railway Labyrinth blog. I had been wanting to buy a model of the E233 for some time but had not decided yet which line to buy. After riding the Nambu line with this train type I decided to get this one. I liked the extra graphics on the sides of the end cars and a 6 car train was just the right size. So on the last day we were in Tokyo I visited a few of the shops in Akihabra. 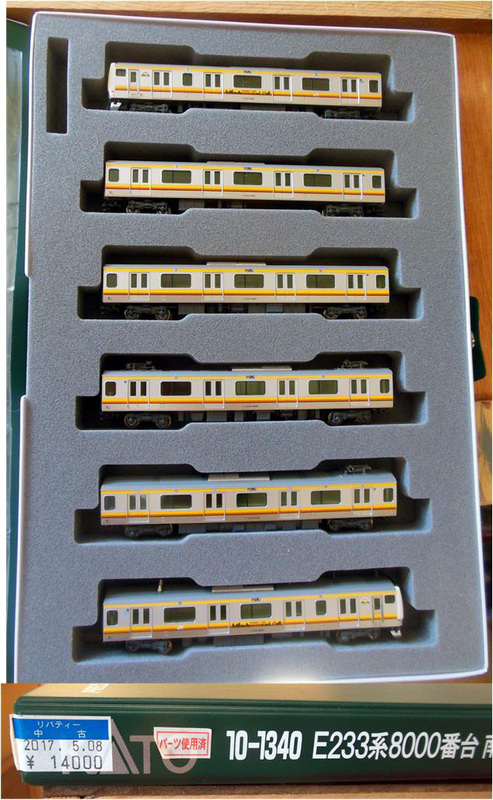 Kato had recently released a model of this train and it was in stock in several shops so I was able to shop for the best price. 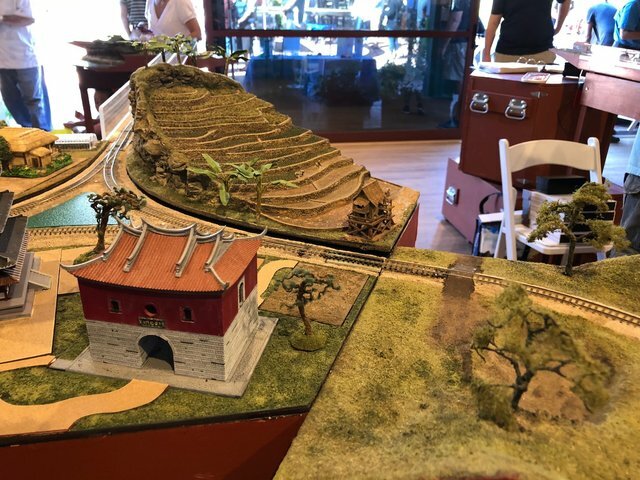 Train Days is an annual event held over a weekend in September at the Los Altos History Museum. 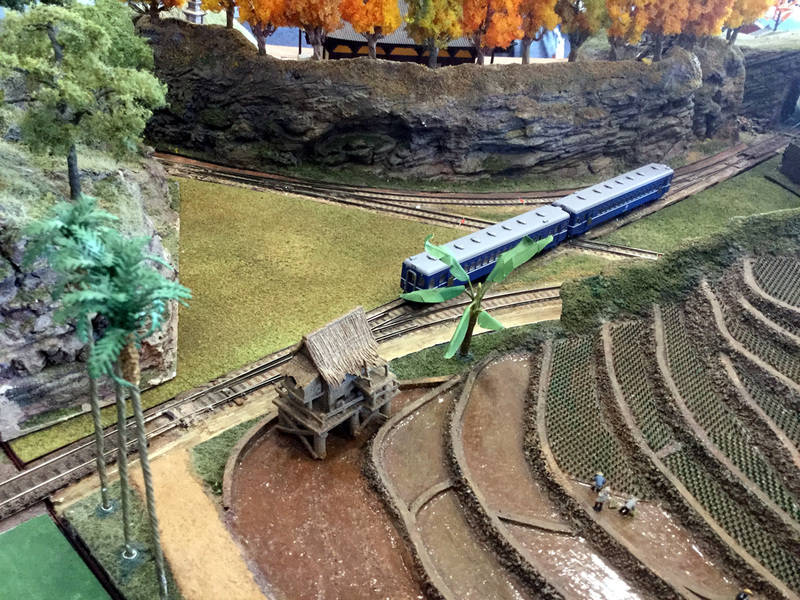 Either Peninsula Ntrak or AsiaNrail, or both have been part of this show almost every year. We have been invited back this year and it is confirmed that we will have the AsiaNrail layout and we hope to have the Ntrak layout there as well. This layout will be the debut for my new module. I have been working on it on and off since April and am now placing the final touches on it. 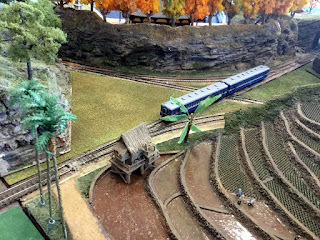 Inspired by last years trip to Kyushu, this module will be viewed from both sides and the cloud back drop shown in this photo is only temporary. 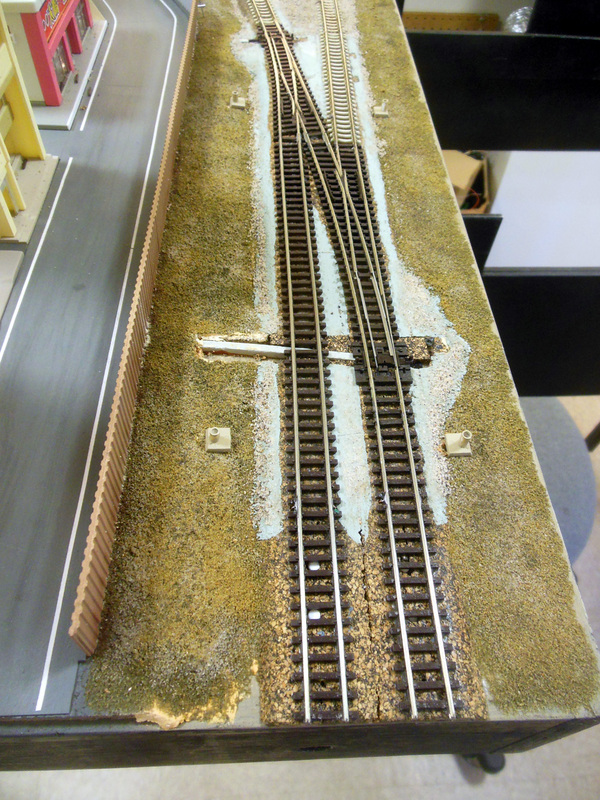 This layout will also be the first on where we will not be using any rail joiners between the modules so it is hoped that setup will be easier.